Last year saw an exciting first for horticultural shows, with the first ever Ascot Spring Garden Festival located at the home of Royal Ascot. Only 6 gardens were selected by the team of judges and awarded a plot at this new event; we were extremely honored to be selected, with the design created by Pip Probert and brought to life by the Outer Spaces team. Yardley of London, a very well known fragrance house based not far from the show ground quickly came on board. It was such a wonderful experience to visit your offices and test all the fragrances, discovering the flowers used and how the fragrances are combined. We then tried to take this away and incorporate both the image of Yardley and also the important fragrances into the garden. After a difficult build, with VERY wet conditions and a few unexpected obstacles we managed to complete the Yardley Flower Garden in time for the public to visit and enjoy the show. The whole experience from start to finish was a bit of a whirlwind, with our main memory being MUD! But what an experience, living on site at the Ascot Racecourse for a month, stunning surrounds – every time I looked up to see the huge stand and the course beyond which oozes grandeur, I felt very proud to be involved. 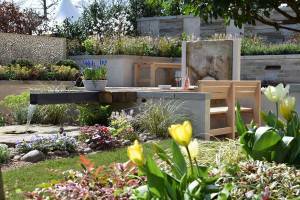 The people came to see the show and also the 6 Ascot Garden Winners, and were then given a chance to vote – and to our surprise, voting our garden the ‘People’s Choice’. This was not only a shock, but also an honor, as this is an award that the public voice, meaning so much more! Later in the year, we went on the RHS Tatton Park Flower Show, which over the last 14 years has become home. This year, with having our commitments earlier in the year, we went for a smaller plot, a JUNGLE! Jungle Fever was designed to transform a small garden with lots of surrounding concrete into a lush green haven. Working closely with various companies such as; Spectrum, Jon O’Grady Reclamation, Marshalls, Brentwood Moss Nursery and Green Matters we tried to create a garden the public would love. Our garden received a Sliver Medal from the Judges and a huge amount of public interest. 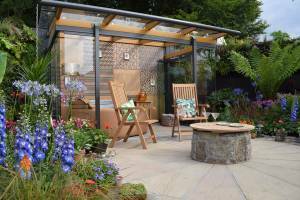 Featured on the Tatton Park TV programme and interviewed by Adam Frost, our garden was shown off to the max. This is always fun, as the show visitors have already seen a sneak preview of the garden and always want to come and have a chat. Full of colour this garden was one of our favorites, a mixture of exotic plants combined with everyday garden plants, creating a tapestry of colour and texture. A beautiful glass building with a hand made feature wall, and of course a Softub!! We have had a very exciting and VERY busy year, but we have grand plans for 2019, so hopefully we will see you this year!